I am serving as a UN Volunteer Interpreter with UNHCR at the European Asylum Support Office (EASO) in Greece, where I provide interpretation services for an increasing number of people every week. By assisting refugees in their communication with Greek officials, I help people understand what their options and their rights are. I feel confident that my work here in Greece will help reduce the suffering of the asylum seekers and give them hope for their future. Thessaloniki, Greece: People from Syria, Afghanistan, Iraq and other countries in the region are fleeing war and desperate situations in their home countries, and making their way to Europe in search of safety. Many of these people now remain in refugee camps in Greece, where they live in very difficult conditions. The Office of the United Nations High Commissioner for Refugees (UNHCR) is trying to help refugees by advocating to improve policies and services that affect the lives of refugees. UNHCR supports the Greek authorities to improve reception conditions, especially for the most vulnerable, as well as the process through which people can apply for asylum in Greece. It also helps in the provision of basic services, such as information, shelter, water, sanitation, food, health and site management. I am serving as a UN Volunteer Interpreter with UNHCR at the European Asylum Support Office (EASO) in Greece, where I provide interpretation services for an increasing number of people every week. By assisting refugees in their communication with Greek officials, I help people understand what their options and their rights are. The Greek Asylum Service has set up a system for people to apply for the relocation programme through Skype, providing a neutral way for refugees to call and reserve a date for their relocation interview. This is helping the refugees to have hope in tomorrow. By acting as a channel between the experts and the refugees, I convey to the refugees that their rights are being preserved by international laws through UNHCR. Through my interpretation services, using basic and simple language, refugees are able to understand me and able to reply to the experts during the interviews. I also cover other duties, such as making phone calls to confirm appointments for the applicants and helping Greek officials in the first steps of the registration of refugees' applications. One story that particularly touched me is that of a girl who was drawing while I talked to her mother. 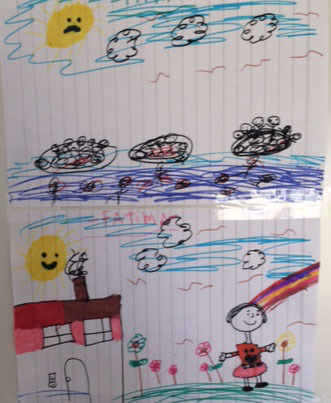 When I gave her the colours, she asked me if she should draw “about the war”. I told her she should draw about life in general, and she immediately started drawing a house. She later also drew a picture with boats and people in the sea. This was very distressing and touching to me. I feel really proud to be part of UNHCR as a UN Volunteer and to be able to provide needed assistance in this humanitarian crisis. I hope that I am helping the families affected by the crisis to go through fast, clear and concise interviews. I feel confident that my work here in Greece will help reduce the suffering of the asylum seekers and give them hope for their future.